Unusual production, which allows us to play the role of a programmer working on artificial intelligence technology. The game has a varied mechanics and a great sense of humour. The independent studio Luden.io is responsible for its creation. 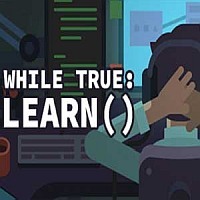 while True: learn() is an original simulator that allows the player to become an artificial intelligence development programmer. The production offers an extensive gameplay, forcing you to cope with various intellectual challenges. Luden.io development studio (known for InCell VR and InMind VR) is responsible for creating this title. while True: learn() was published by Nival. We play as a programmer who one day discovers with surprise that his cat is really good at coding. Unfortunately, the cat can't speak, but it skills can't be wasted, right? Therefore, the programmer decides to use techniques typical for machine learning to build an interface for cat-to-human communication. The gameplay in while True: learn() is mainly about making decisions and solving logical puzzles - e.g. arranging the patterns visible on the screen in a coherent and meaningful sequence. The game is a kind of interpretation of the realities of machine learning and poses specific challenges for the player (such as building an unmanned car). We get money by completing missions, which we can use for various purposes - for example, to purchase ornaments, thanks to which we can improve the appearance of our room (e.g. collector figurines). There is also a possibility to buy better computer equipment which will make our work more efficient, and even.... outfits for the cat. Interestingly, the production of Luden.io allows us to decide whether we will work as a freelancer or to start our own startup - this will make us a beginner boss. We also perform a whole range of typical activities, such as reading e-mails, signing contracts, and even.... commenting on forums. While True: learn() offers only a single player mode. The creators did not prepare any multiplayer modes. while True: learn() has a rather simple, two-dimensional graphic design, which consists mainly of illustrations and statistic screens. The graphics were made in a rather characteristic style (reminiscent of some animated films). The game also has a great sense of humour.